The Solomon R. Guggenheim Museum in New York City is popular with fans of modern art and architecture. The Frank Lloyd Wright-designed building is probably the most famous aspect of the Guggenheim Museum, but visitors can also enjoy exploring the permanent collection and the ever-changing array of exhibitions. The Guggenheim Museum has an extensive permanent collection of modern art from Picasso to Pollock. Most of the museum's viewable artwork at any time is from the current exhibitions. Before you commit, check the website to learn what the current exhibition is, as well as whether the famous spiral ramp will be open when you plan to visit. The Guggenheim is open on Mondays, when many other New York City museums are closed, making this one of the busiest days to visit. If Monday is the best day for you to visit with your schedule, plan to arrive early (as close to 10 a.m. as possible) and you can enjoy the Guggenheim's exhibits and collections before the crowds take over. Saturday evenings are "Pay What You Wish," so this is also a pretty busy time. To beat the crowds on Saturdays, plan to finish up before the 5:45 p.m. start of discounted admissions. If you plan to visit a number of New York museums and attractions during your visit, you might consider investing in either the New York Pass and New York CityPass. Look into each one to see which is right for you and your itinerary. If you choose to purchase one of these passes, you should skip the regular admissions line at the Guggenheim and instead go to the Membership Desk to get your ticket. Another way to save on the admission price is to brave the crowds and go on Saturday nights when there is a pay-what-you-wish donation policy after 5:45 p.m. (the museum closes on Saturday nights at 7:45). Take advantage of the Guggenheim Museum's coatroom to rid yourself of any coats, umbrellas, and bags that might be bogging you down once you enter the museum (you'll need to buy your ticket first because they'll want to see it when you check your items). The coatroom also has wheelchairs available for visitors who might need them, as well as baby carriers for those visiting with small children. The restrooms located off the main lobby tend to be very crowded, but there are unisex restrooms located throughout the museum, so head upstairs to avoid waiting in a long line to use the facilities. Tours are included with the cost of museum admission, so take advantage of them. Self-guided audio tours can be picked up in the lobby (or downloaded on your iPhone) and used as you explore on your own. 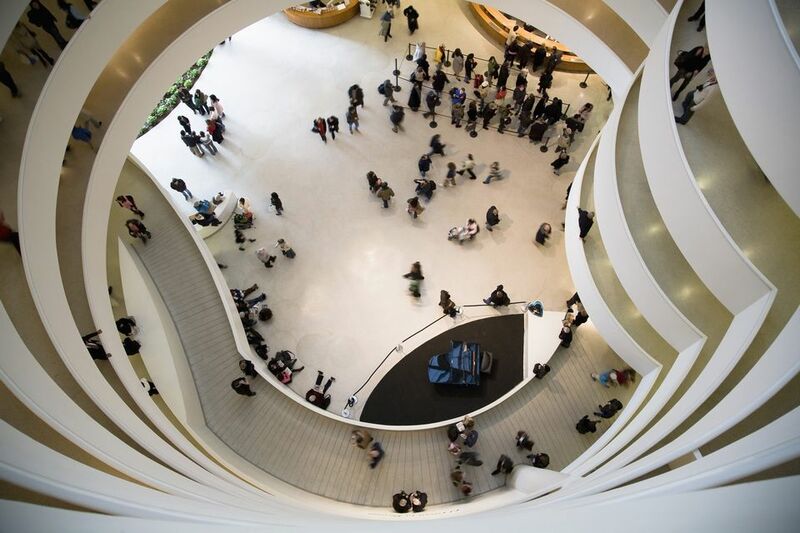 Daily at 11 a.m. and 1 p.m. there are free guided tours that lead visitors through the highlights of the Guggenheim's permanent collection as well as current exhibitions. On select Fridays at 2 p.m. curators lead tours of current exhibitions. Throughout the museum, you can find Gallery Guides who are trained to engage with visitors in one-on-one discussions about the art and exhibits. Dressed in black, with colorful scarves/ties and a blue or orange button that says "Ask Me About The Art," they're easy to find throughout the museum. When you visit the Guggenheim Museum, one of the best ways to methodically work your way through the museum is to take the elevator up to the top floor and work your way down the spiral interior while you explore the various exhibitions and galleries along the way. This way, you'll quickly escape the crowds hanging out in the lobby and have gravity working with you as you experience the museum's extensive exhibits and permanent collection. Children under 12 are admitted free to the Guggenheim Museum with a paying adult. Small strollers are allowed in the galleries, but jogging strollers and double strollers are not. The good news is that the coatroom offers backpack carriers that you can borrow to use while you visit the museum with your children. The Guggenheim has put together great resources for families visiting the museum, whether you want to do some preparation for a visit or plan to attend a special family-oriented event. There are fantastic workshops for families with children as young as 3, so check out the offerings that will be available during your visit. Family-centric programming is most frequently offered on the weekends. The Guggenheim Museum participates in the annual Museum Mile Festival, offering many visitors free admission during the annual street festival held in June. For visitors just wanting a peek inside, you can visit the Guggenheim Museum Cafe and gift shop free of charge (though they no longer allow visitors to enter the lobby/rotunda without paying admission). Families will appreciate that children 12 and under are always free! Visit The First Children's Museum in the World... Right in Brooklyn! Space Shuttles, Submarines and Aircraft Carriers, Oh My! Pose With Your Favorite (Wax) Celebrities in Times Square!